John Hardy Jewelry Well-Cared For, Fares Well! "Date" your John Hardy jewelry. Take it to out to dinner and a movie, but don't wear it to cook, clean, exercise or submerge it in water (like the pool, ocean or hot tub). Put your John Hardy jewelry on last as a final complement to your outfit after all your lotions, potions and make-up have been applied. Wipe your John Hardy jewelry off after you've worn it, before putting it away. A soft cloth or chamois works just fine. Your John Hardy pieces should have a separate and distinct place of their own in your jewelry box. Non-abrasive, non-bleach and non-abrasive mild cleansers work best for cleaning John Hardy sterling silver jewelry. As needed, a soft toothbrush can be used to gently brush away persistently dirty areas. Work quickly, so the pieces are not soaking for any length of time. John Hardy gold pieces will become brighter and shinier when washed in a diluted vinegar solution for 20 seconds. Use warm, soapy water to clean John Hardy jewelry adorned with gemstones. John Hardy jewelry was meant to be worn and enjoyed. A little TLC will keep you wearing and enjoying your John Hardy pieces for years! Never use anything abrasive on any of your gemstones. Including silver cleaners because they clean with an abrasive. High heat to extreme cold can weaken and can split porous stones. 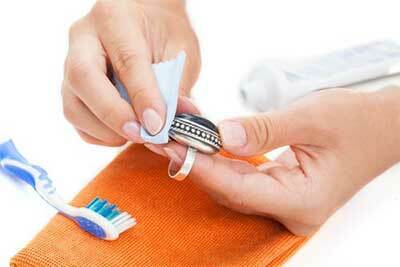 Never rub any jewelry with paper towels as they contain wood fibers. Baking soda and toothpaste will dull your shiny finishes over time. Often times people will use toothpaste their toothbrush for scrubbing. A regular adult toothbrush can be too harsh and when combined with abrasive materials can scratch your the metal and finishes on your stones. If you are going to use a toothbrush, it is best to use a child's toothbrush or a horse hair brush to clean your jewelry. Store your jewelry separately so the harder stones don't scratch your other pieces. Never soak Turquoise, Opals, Pearl, Opal, Emerald, Amber, Coral and Onyx and any other soft porous stone. This can damage these gemstones, as residues left behind once the water has been absorbed build up leaving them dull and lacking their original shine. For the same reason, care should also be taken to avoid contact with make-up, perfume or hairspray. When such stones are dampened, they should always be allowed to dry completely before being stored away. In emeralds, natural flaws are often filled and hidden with oil, harsh cleaning will remove this oil, producing a dull effect on their appearance. By definition, hardness is the ability to resist scratching, nothing more. All gemstones will still break. Some of the harder stones are Diamonds, Rubys, Sapphires and Topaz. Even though these are harder stones they can be scratched, broken or damaged. Diamonds will chip and break. It is very important to have your jewelry checked occasional by a jeweler to make sure prongs are secure.